AnyMP4 iPhone Video Converter for Mac can convert any popular video to iPhone compatible video and audio format. And you can also use it to extract audio files from videos and then convert them to iPhone supported audio formats like MP3, AAC, WAV and more. Also it supports multiple Apple devices like iPhone5S/5C, iPhone5, iPad Air, iPad mini 2, iPod touch and others. Besides, it owns some powerful video/audio editing functions for you to choose. AnyMP4 iPhone Video Converter for Mac can help you convert many popular video files to iPhone compatible video and audio formats, such as MP4, MOV, M4V, H.264, MPEG-4, AAC, AIFF, ALAC, MP3, M4A, WAV and so forth. Also, with it you can extract audio files from the videos and then convert them to iPhone compatible audio formats. 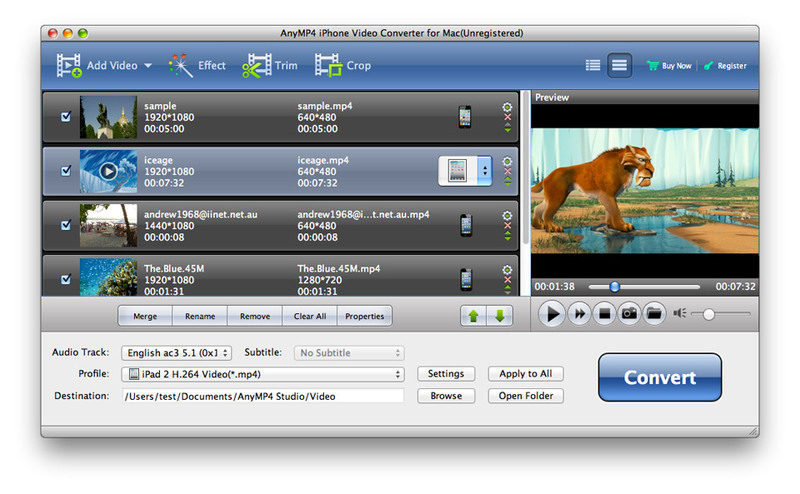 With AnyMP4 iPhone Video Converter for Mac, you can cut off any part of the video from the whole movie by setting the start time and the end time, cut off the black edges of source video to get the better play effect, add text or picture watermark to personalize the output video and merge several video clips together to a single file. Anymp4 iPhone Video Converter for Mac has the intuitive interface with which you can preview the playing effect clearly and easily. Also, you can capture your preferred snapshot while you watch the videos and share them with your friends.